Greg Hughes is the majority whip of the Utah State Legislature and the chair of its conservative caucus. He got a 100 percent score last year by the conservative Sutherland Institute, a Utah think tank. He also chairs the board of the Utah Transit Authority. Utah state legislator Greg Hughes points to his daughter, sitting behind him, and says her generation wants to ride transit. Hughes grew up in Pittsburgh, Pennsylvania. He said he always understood that public transportation has a place in a city of that size. In fact, he used it himself, as he didn’t have access to a car while he lived there. (Hughes attended college in Utah, so may not have been of driving age for much of his Pittsburgh residency.) But even at the time he joined the board of the UTA, he still thought transit didn’t make sense for Utah. [I] was able to understand a little bit better, in a state like Utah, where you see how quickly we’re growing, the absolute need we have to be multi-modal. When I sat every year and looked at how many roads we needed to keep in good repair, and how much expansion we needed for the population that was growing, I became agnostic in terms of mode. Infrastructure is a perfect place for bipartisanship, Hughes said — a lesson that some national lawmakers seem to have learned from MAP-21 and the recent passage of the water resources bill. As we find these areas of agreement that exist in public policy — and they don’t always exist; I know this — I think that it builds confidence in our constituents. So when we don’t agree on some things, maybe there’s more legitimacy to those disagreements. Because we have found places where we work together, where we get things done, where we make things better for our constituents. Later in the hearing (you can watch the video here), which was held to examine the federal New Starts transit program (more on that later), Hughes touted Salt Lake’s brand new streetcar, which has already attracted a billion dollars of development around the corridor. He said the real subsidies come in when the transit agency starts building parking. 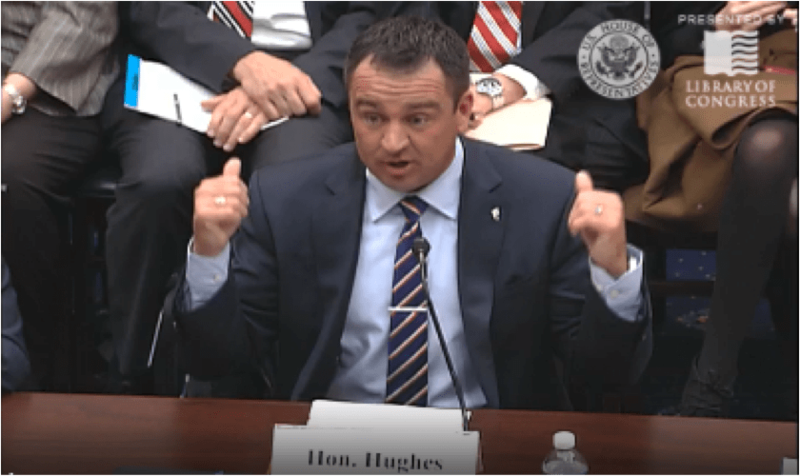 Hughes brought his 14-year-old daughter to Washington with him and he gestured to her at one point in the hearing and said, “This is the generation we’re talking about.” The “emerging workforce” wants to stay productive while they commute and “explore the freedom technology now brings.” That freedom, he indicated, is found in transit. He also forgot the people who now are willing to move to Utah becase they have rail. TOD is a huge problem. I live 250 feet from rail. 200 feet is walking through a parking lot. The bigger problem which he doesn’t mention is the smog. Yor not going to attract more people & investment with smog. Salt lake just introduced the 30 dollar monthly transit pass. Rep Greg Hughes you do not know what you are talking about. UTA has Destroyed the Bus System, many Individuals are having to Walk Blocks to a Bus Stop or Trax. Utah Transit Authority is not a Friendly Car-Free & Transit Oriented System. UTA Encourages Choice Riders to Drive to Park & Ride Lots to take Trax, FrontRunner & the StreetCar. Ridership Help UTA Executives Earn there Excessive Salaries & Bonuses at Taxpayers Expense. The SugarHouse StreetCar is Government Waste. The Residents of South Salt Lake are being told Walk or Ride a Bike, this is not Convenience. I sure wish the Federal Government would take time to come to Utah to do real Investigation into Utah Transit Authority, there so much Corruption. Tammi Diaz has been angry for years that UTA eliminated a bus route, the 203, that ran very close to her home. The route was performing rather poorly, and two fifteen-minute-headway routes paralleled the 203 two blocks away. So, UTA—faced with an ever-declining revenue stream—eliminated the lowest-performing routes first. Diaz sees this as a sign of rampant graft in the system. It’s also pretty interesting that Diaz rebukes UTA for encouraging driving to stations, but then in the next paragraph criticizes the streetcar for having no parking and encouraging waking and biking to stations. To be sure, UTA cut service across almost every bus route between 2009 and 2012, thanks to the economic downturn and a mandate to complete a seventy-mile rail expansion. But bus service was cut across the nation. To say that the system was destroyed is wholly inaccurate. UTA is so Good at Lying Route 203 was not Lowest-Performing Ridership. I started fighting the Winter of 2007, the first round of UTA Canceling Bus Route was in August 2007 for the Route 203 was Cancel in 2011. Utah Transit Authority did not have Economic Down UTA Executives Still receive their Excessive Salaries & Bonuses at Taxpayer Expense. Hundreds, Hundreds & Hundreds of Hundreds Individuals have been Hurt from the Destruction of the Bus System. I know Individuals that have to Walk Blocks to Trax or a Bus Stop. There two People that live in Riverton at care center brain injury that would like to go to a LDS temple cannot go can’t because the bus system has been destroyed. There has been a Increase in Population the the Area that UTA Services, but the Bus System has been Destroyed. UTA taking Buses out of Neighborhoods has Increase in Poverty and Crime. Taxpayers are having to Pay 75% of Paratransit Fares because its $4.00 each each way, the Disabled cannot afford $4.00 each if the did not Pay the Fares for Paratransit UTA would be force to Lower the Fare because would have Ridership on Paratransit & Lose Federal Funding. I Love the Regular Fixed Bus Route I make friends, shopping & go to the doctor, but can’t access the Bus System, come July 2014 the State of Utah be Paying for my Paratransit I can’t afford $4.00 each way I would rather have my bus route. Only take Paratransit went I really need it. Its the Government Responsibility not UTA. Utah Transit Authority has the Best Rail System in the Country but a Very Poor Bus System. Utah Transit Authority is so Good at LYING. There needs to be a Real Investigation into UTA. There needs to be Real “FACT FINDING”, to End the Corruption. Tami Diaz has been ranting for years against UTA because the bus she uaed to ride was eliminated in a system reorganization. The 203 didn’t have the worst ridership in the system—and no one said it did—but it still was pretty bleak. And the August 2007 route changes were not cancellations. It was a wholesale redesign of routes that bulked up routes in Salt Lake City proper and its immediate suburbs, and reduced ridership in outlying suburbs that were archetypes of urban sprawl. The 2007 redesign essentially was a product of new urbanist ideals: focus first on providing great service to areas that are conducive to transit (i.e., walkable, dense, etc.). In any event, let’s take a look at the 203 in 2008. Here are the 200 and the 205 at that same time. As they both run two blocks away from the 203, one can see why UTA eliminated a route like the 203 in the face of a reduction in funding. Your Riverton example really isn’t unique to UTA. Riverton is a prime example of an outlying suburb that is the epitome of sprawl. People in other cities that want to move from one outlying suburb to another via transit are just going to have a tough time. And it’s interesting that you say this is the result of a “destroyed” bus system, as out in Riverton there was never a very substantial bus system to begin with. Persons with disabilities that wish to use transit to get around should definitely not expect to live in Riverton and have full mobility. This is the same in any other city in America that has seen a pattern of sprawl in the last several decades. I’d love to see a source, a citation that a reduction in bus service leads to an increase in crime. Tammi, I’m sorry, but UTA is not the perpetual liar that you proclaim it to be. The state legislature has conducted full-scale audits, in 2008 and 2012, and found no evidence of the corruption of which you seem to be so sure. You must be very hurt that the 203 was eliminated, and that’s understandable. But I just don’t recommend turning that negative feeling into a inaccurate smear campaign against a transit agency. Please Garrett (ctylem) must Work for UTA. All UTA Executive Care about is Ridership on Trax, FrontRunner and StreetCar & bring in alot of Federal Dollars Help Utah Transit Authority Earn there Excessive Salaries & Bonuses at Taxpayers Expense. The next Bus Route to be Cancel or run less Frequent is the Route 21 so UTA can try to Increase Ridership on the StreetCar. UTA has Very Poor Customer Service. A Good Bus System does Earn the Utah Transit Authority Executives the Excessive Salaries & Bonuses at Taxpayers Expense. UTA has very Best Rail System in the Country but very Poor Bus System. There Major Bus Route Cancel in August 2007, to Help make it more affordable to start expand Trax & FrontRunner because the more Federal Dollars that come into the State of Utah Increases the UTA Executives Salaries & Bonuses. Why was UTA in so much of a Hurry to get the Union to Sign a Contact or there would be “FACT FINDING”? After paying for monthly passes for NJ Transit, I weep at the pure value you get from that.